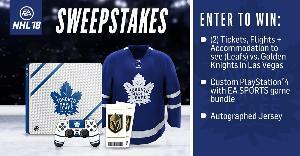 Prize: Custom Toronto Maple Leafs branded PlayStation 4 console; autographed Toronto Maple Leafs team jersey; 4 tickets to a Toronto Maple Leafs game of Toronto Maple Leaf’s choice including a meet and greet with a Toronto Maple Leafs’ Alum ($1,800). Statistics: This contest was opened by 134 and entered by 19 ContestChest.com members. 14% of those who opened the contest, entered it.